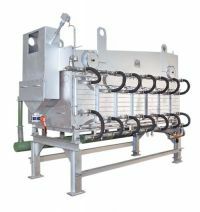 The fluid-bed cooler-sifter is fitted with baffle-plates arranged at right angles to the longitudinal walls of the housing and forcing the sand to flow alternately over and under the plates. The resulting spaces, the so-called chambers, house the heat exchangers through which cooling water is circulated. The bottom of the housing is permeable to air but not to sand. While hot sand is fed into the FKS through the inlet, air produced by a fan is blown through its air-permeable bottom. This procedure fluidizes the sand, allowing it to flow freely and to behave like a liquid in communicating tubes. The fluid bed is filled to a controlled maximum level before the sand leaves the FKS again at the discharge end. While the sand flows through the individual chambers it passes along and is cooled by the integrated heat exchangers. At the outlet, a thermostat monitors the sand outlet temperature. In the course of this process, the dust contained in the sand is expelled by the fluidizing air. 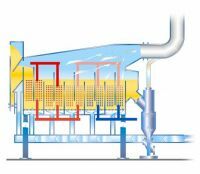 The dust is then evacuated into the dust separation filter through a dust gas line.